Image caption David Davis said the coalition's deficit-cutting programme had been "too little, too late". A senior Conservative MP has urged Chancellor George Osborne to use "shock therapy" to create economic growth. 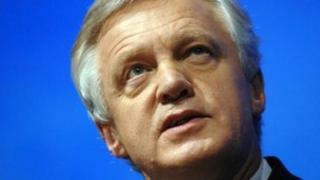 David Davis said Mr Osborne should cut taxes and spending further to "reinvigorate" fortunes. The former shadow home secretary said the economy, which has been contracting since the start of the year, was in the "11th hour, if not the 59th minute". Prime Minister David Cameron has promised to show "fighting spirit" to try and turn things around. Mr Davis, who stood against Mr Cameron for the Tory leadership in 2005, urged Mr Osborne to use the Autumn Statement later this year to set out plans to end the recession. In a speech to the Centre for Policy Studies think tank in London, he said the economy needed "shock therapy to jolt it out of the torpor". He added: "Inaction could deliver decades of decline and disappointment to a whole new generation." He suggested the coalition's deficit reduction programme had been "too little, too late" and called for a wide-ranging package of support for small and medium-sized businesses. That meant cutting taxes, regulation and energy costs and ensuring adequate bank lending was available. Mr Davis said: "We are not quite out of time. It's the 11th hour, if not the 59th minute. "Our chancellor is a clever and resourceful man. He should take the opportunity of the Autumn Statement in a few weeks' time to lay out a plan to reinvigorate Britain." On Sunday, the prime minister promised to show "fighting spirit" as he prepares to announce a series of measures designed to promote economic growth. He said he wanted to "cut through the dither" which had held the UK back. The government has said it will underwrite up to £50bn of private sector building projects which need finance. The Treasury said the The Infrastructure (Financial Assistance) Bill, which expands on a scheme launched in July, will facilitate £40bn of construction projects by using the government's low interest rates to underwrite them. Ministers are also expected to set out plans to underwrite construction of up to £10bn worth of new homes, including guaranteeing the debt of housing associations and private sector developers. In addition, the government will legislate to speed up planning decisions and encourage development of Green Belt land, if certain conditions are met.